SP500 Financials HVol: Unusual Behavior ? ​we had a range trade pattern in SRFI. But what is interesting, ​it is that HVol is ​getting lower after a false break out on July 22 with Financials, that was the very first unusual ​trading behavior. 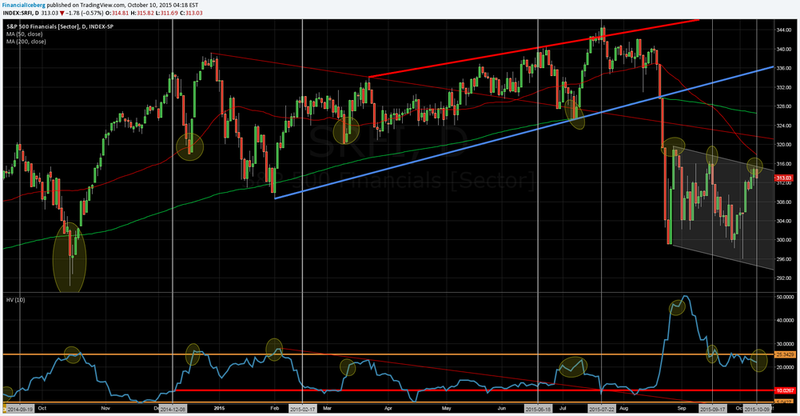 ​​( See 1st chart below - Red Trendlines - Ellipses) SP500 Financial Sector ( SRFI ) Peaked at 344.90 on July 23rd. ​​​​In fact, when we broke a Rising Wedge Pattern on August 20 2015 at 329.80 and also the 200 DMA ( Day Moving Average​​ - Green Line on the chart below ) then at 329.73 on SRFI ​, ​game was over on a short term basis and then ​reached then the panic ​selling level on August 24 at 299.11. 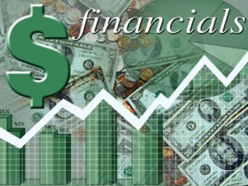 ​​Since September 2 til now, we had a decrease​​ in the Historical ​Volatility ​on SP500 Financial Sector ( SRFI ) ​with a bullish ​trend in Financials since... Closing price on SRFI on October 9 was at 313.03. The SP500 Financial Sector ( SRFI ) is now trading within a Downtrend Channel that started since August 25 as shown by the chart below. ​​​​But the most interesting technical factor is that the ​Historical Volatility ( HVol ) on SP500 Financial Sector ( SRFI ) is not falling as we did see in previous top but staying at level seen in previous bottoms. A very unusual behavior if we look back at history. (See Ellipses - Chart Below ).